Stainless steel flagpole..065 Brushed SS,Never Furl Flag attachments,Aluminum ends,Aluminum gold anodized ball.Flag and bracket sold separately or as a set. Made in USA. 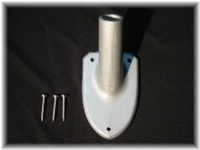 includes shipping in 48 This is the same bracket used in our sets.Cast aluminum with a silver powdercoat finish.supplied w/ stainless screws.Will fit 4x4 post.$23.95 includes shipping. 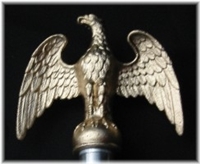 Add a gold painted eagle to the top of your stainless steel flagpole.Cast in aluminum to be rust free.